Depo-Medrol is a synthetic corticosteroid used in the treatment of many different conditions, including autoimmune diseases such as lupus and some hemolytic anemias. It is also used to treat asthma and certain skin diseases in cats. How it works: Depo-Medrol has an effect on virtually every organ system in the body. 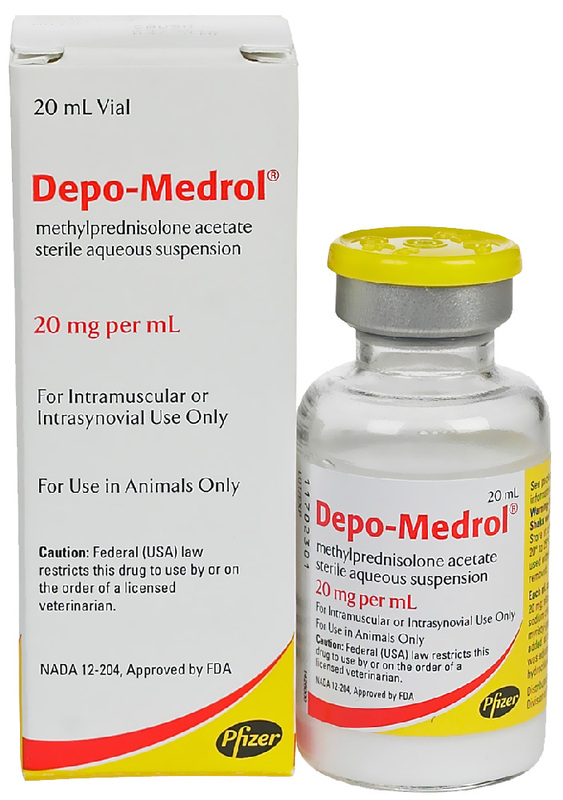 Depo-Medrol is a corticosteroid that blocks the production of substances that trigger allergic and inflammatory actions. Depo-Medrol is used to modify the body's immune response. At lower doses it helps to reduce inflammation by decreasing the activity of certain cells and chemicals produced by the body that cause inflammation. At higher doses, it can suppress the immune system by decreasing the number of cells necessary for a proper immune response. INTRAMUSCULAR Following intramuscular injection of methylprednisolone acetate, a prolonged systemic effect results. The dose varies with the size of the animal patient, the severity of the condition under treatment, and the animal's response to therapy. View Depo-Medrol Drug Facts Sheet. Dogs and Cats: The average intramuscular dose for dogs is 20 mg. Following the size of the dog and severity of the condition under treatment, the dose may range from 2 mg in miniature breeds to 40 mg in medium breeds, and even as high as 120 mg in huge breeds or dogs with severe involvement. Injections may be made at weekly intervals or following the severity of the condition and clinical response. Horses: The usual intramuscular dose for horses is 200 mg repeated as necessary. For maintenance therapy in chronic conditions, the initial dose should be reduced gradually until the smallest effective (i.e., individualized) dose is established. MEDROl® Tablets containing methylprednisolone may also be used for maintenance in dogs and cats, administered according to the recommended dose. Allergic Conditions: This preparation is especially beneficial in relieving pruritus and inflammation of allergic dermatitis, acute moist dermatitis, dry eczema, urticaria, bronchial asthma, pollen sensitivities and otitis externa in dogs; allergic dermatitis and moist and dry eczema in cats. The onset of relief may begin within a few hours to a few days following injection and may persist for a few days to six weeks. Symptoms may be expected to recur if the cause of the allergic reaction is still present, in which case retreatment may be indicated. In treating acute hypersensitivity reactions, such as anaphylactic shock, intravenous SOLU-DELTA-CORTEF® Sterile Powder containing prednisolone sodium succinate, as well as other appropriate treatments, should be used. Overwhelming Infections with Severe Toxicity. In dogs and cats moribund from overwhelmingly severe infections for which antibacterial therapy is available (eg, critical pneumonia, pyometritis), DEPO-MEDROL may be lifesaving, acting to inhibit the inflammatory reaction, which itself may be lethal; preventing vascular collapse and preserving the integrity of the blood vessels; modifying the patient's reaction to drugs; and preventing or reducing the exudative reaction which often complicates certain infections. As supportive therapy, it improves the general attitude of the animal being treated. All necessary procedures for the establishment of a bacterial diagnosis should be carried out whenever possible before institution should be administered for the shortest possible time compatible with maintenance of an adequate response, and antibacterial therapy should be continued for at least three days after the hormone has been withdrawn, Combine hormone and antibacterial therapy does not obviate the need for indicated surgical treatment. 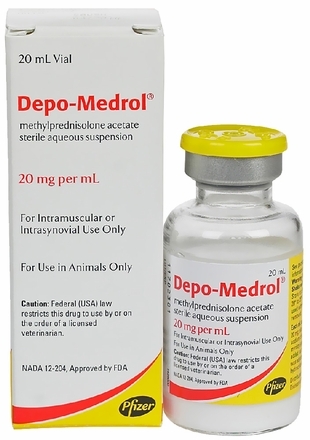 Other Conditions: In certain conditions where it is desired to reduce inflammation, vascularization, fibroblastic infiltration, and scar tissue, the use of DEPO-MEDROL should be considered. Snakebite of dogs also is an indication of the use of this suspension because of its anti-toxemic, anti-shock, and anti-inflammatory activity. It is particularly effective in reducing swelling and preventing sloughing. Its employment in the treatment of such conditions is recommended as a supportive measure to standard procedures and time-honored treatments and will give comfort to the animal and hasten complete recovery. Contraindications: Systemic therapy with methylprednisolone acetate, as with other corticoids, is contraindicated in animals with arrested tuberculosis, peptic ulcer, and Cushing's syndrome. The presence of active tuberculosis, diabetes mellitus, osteoporosis, renal insufficiency, predisposition to thrombophlebitis, hypertension, or congestive heart failure necessitates the carefully controlled use of corticosteroids. Intrasynovial, intratendinous, or other injections of corticosteroids for local effect are contraindicated in the presence of acute infectious conditions. Exacerbation of pain, further loss of joint motion, with fever and malaise following injection may indicate that the condition has become septic. Appropriate antibacterial therapy should be instituted immediately. Warnings: Clinical and experimental data have demonstrated that corticosteroids administered orally or parenterally to animals may induce the first stage of parturition when administered during the last trimester of pregnancy and may precipitate premature parturition followed by dystocia, fetal death, retained placenta and metritis. Additionally, corticosteroids administered to dogs, rabbits, and rodents during pregnancy have resulted in cleft palate in offspring. Corticosteroids administered to dogs during pregnancy have also resulted in other congenital anomalies, including deformed forelegs, phocomelia, and anasarca. Not for human use. Do not use in horses intended for human consumption.